I want to thank our guest author for a wonderful Thanksgiving Day money saving tips post. Please visit our guest author at Mojave Max and 'like' on Facebook!! Enjoy and I can't wait to see what your table looks like...feel free to share your pictures. It happens every year- the magazines come out filled with dozens of photographs of perfectly decorated holiday tables. If you are hosting your own dinner (or a pot luck to save some money! ), you don't have to have table envy. Here are some creative ways to make your Thanksgiving presentation picture perfect. The magazine shows beautiful place card holders on the table for each guest. These start at almost $4.00 each! Try mini pumpkins instead! Simply buy a bag of them- I have seen them for as low as $4.00 per bag of 10! Cut out business card-sized pieces of thicker card stock and write each guest's name on the card. You can even decorate the card with stamps or glitter! Cut a thin slit across the top of each pumpkin and place the card in the pumpkin- instant place card holders! Use a fork. A decorated piece of paper with the guest's name on it can be slotted into a fork and placed on the center of the plate. Try leaves! The week before Thanksgiving, collect and press fallen leaves in books. On Thanksgiving, simply (and carefully!) write each guest's name with a gold paint pen and place the leaf in the center of the plate- you can also attach a ribbon to the stem and tie it around a wine glass. You can also cut out leaf shapes from paper if you don't want to use real leaves. The website shows beautiful flower arrangements. Unless you have a floral market license, chances are these arrangements start at $50.00 and head waaaaay up from there. 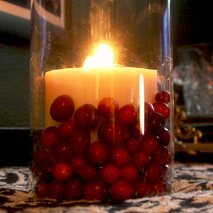 Simple clear vases filled with cranberries look elegant and are super easy to make! Bags of fresh cranberries can be marked down drastically low along with the typical Thanksgiving foods in your grocery store. For a dramatic look, you can find tall, thin branches and arrange them in long thin vases (the local dollar store usually has a ton of these!) and fill the vases with cranberries. You can also use shorter clear containers and put a votive candle in the center of the cranberries for elegant lighting on your holiday table. Carved pumpkins aren't just for Halloween. Cut the hole from the bottom of the pumpkin and make a small vent hole near the stem. Once you have the inside cleaned, punch or carve patterns into the pumpkin all the way around- think squares, stars, or circles that form lines around the entire pumpkin so it looks similar to an ornament. When lit from the inside with a candle, these create beautifully lit centerpieces! Pile on the pumpkins (and gourds!) Buy a variety of gourds and arrange them in a pile down the entire center of your table. Through the center of the pile, choose three or five of the more stable ones and cut taper-shaped holes into the tops of them- instant candle holder! Gold or copper spray paint (look for floral spray paint) lightly dusted over any pumpkin (and around the holes if you have carved it), squash, or gourd brings elegance to the table- use it sparingly though (dust the stem and around the top with gold), or it can start to look kind of cheesy! The tv show shows fine china and silver on a beautiful tablecloth. Getting matching place settings for every guest can run you thousands of dollars. Coordinate. The key is matching pieces, not which company signed the back of the plate. The dollar store sells simple white plates for a dollar each- you can bring in color with bright red or orange napkins (also from the dollar store!). Be shabby chic. Hit up the thrift store and find two or three sets of matching dishware- simply keep the same shape and try and stay in the same pattern family for continuity. When every third person has the same patten, your table will look eclectic and unique! If you're in the city, try to find your restaurant supply store- chances are they have a used section with hundreds of the same plate, fork, or napkin for very cheap! Tablecloths do not have to be monogrammed, embroidered statements. Again, try your thrift store! You can also forgo the tablecloth and make a table runner- find a fabric you like long enough to cover the length of the table. Cut the width of it down to a little over 2 feet long, and men the edges by either sewing them or ironing them with new-sew tape. You can use fabric dye on a plain cloth and create patterns or add leave shapes, or you can use bleach spray with stencils for a different effect! With a little searching around and ingenuity, you can feel confident with a beautiful holiday table. Happy Thanksgiving!